For director Clayton Vila, the relationship with Teton Gravity Research has always been a collaborative experience. Unique within action sports filmmaking, Clayton often creates two different cuts from the same TGR segment. One seamlessly aligns with TGR’s snow film, and in his director’s cut, Vila has complete artistic freedom. In fact, before he even stepped behind the lens for Far Out’s Crested Butte segment, Vila was given considerable creative control. The prompt was pretty open-ended with only two parameters. Crested Butte, Colorado, was the location, and of course, it had to be a ski segment. That’s it. The rest of the puzzle would be pieced together by Vila's unconventional creative direction. Drawing on Crested Butte’s Americana roots, Vila decided to pay homage to one of the most iconic genres of cinema: Westerns. Enamored with the romantic sweeping landscapes and the rebel attitude of cowboys, Vila let the genre and environment dictate his process. With each decision behind the lens being intentional, the audience is left to ponder the question: Is Sean Jordan really that different from an Old West cowboy? How did you originally approach shooting the Crested Butte segment? CV: I shoot to edit. I make a script and a shot list and stick to it. TGR gave us a location, which was Crested Butte, Colorado, and wanted something cool to happen, and asked us for our ideas. Those were our creative boards. I told TGR that I love Westerns and the landscape out there, and we wanted to emulate that genre of cinema. And that’s what we did, which we tried to do subtly by using vintage anamorphic lenses for the project. Kowa anamorphics are along the lines of the cinematography style that the old Westerns used amongst that time era. From there it's about where you point those lenses. We were keen about doing those big static landscapes where the scene has a while to breathe. That’s another aspect of that genre, which really lent itself to the piece in a subtle way. 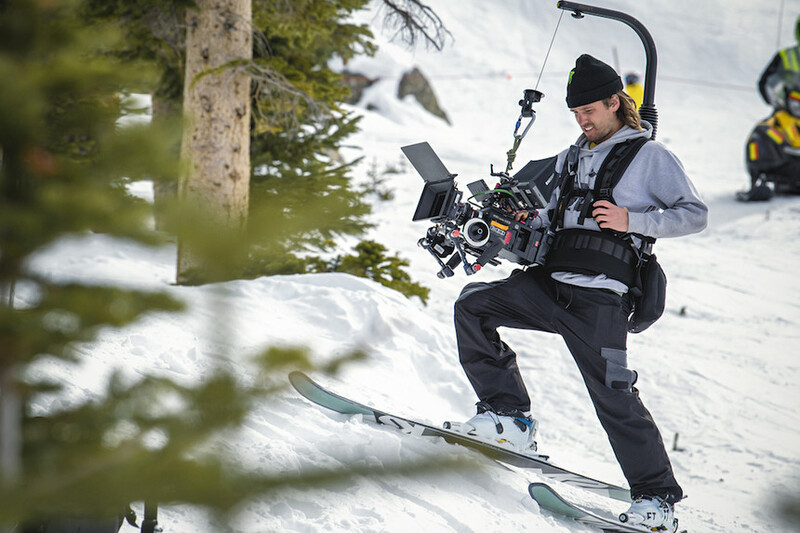 Vila poised and ready for the shot in Crested Butte for "Far Out." Nic Alegre photo. In the director’s cut the cowboy character is explored a bit more, what was the thinking behind that? CV: The writing structure of the Western genre revolves around a lone ranger. Essentially a badass independent character. The behavior of someone who would hike up a mountain to ski on their own and do amazing tricks is how I interpret the idea of a modern-day cowboy. It’s one of those things where you’re not looking into the true meaning of being a cowboy, which a more stubborn or traditional mindset would overlook. It’s still alive and well to be the type of person that a cowboy is/used to be, and I think in action sports there are a lot of similarities to the cowboy lifestyle, which is high risk and hard work. We just wanted to show the subtle comparison of the two. We kept the idea indirect and didn’t want to force it upon the audience so that in the end you decide if this character is really the embodiment of a cowboy. There are some pretty big differences when it comes to the post-production between the two. For example, the audio is kept raw this time around, why’s that? CV: It goes back to the genre. Westerns really breathe and they’re slow burns. Sure, you think of the whistling classic old west song, but in reality, that’s such a small part of that genre. To me what feels like a Western are the things we discussed previously. When you look at a film like No Country For Old Men it does not have a single song. In the entire thing. So in the end, it’s a matter of paying homage to that style. When the snow conditions are less than ideal, you start integrating your surroundings as Vila and his team did. Nic Alegre Photo. Were there any other Western films that influenced you? CV: I pull references a lot, especially for projects like this where you’re trying to recreate a genre. No matter what you’re working on within cinema, you’re always working within the boundaries of what’s been done before you. I take everything from cinema, even when I’m making a commercial, and the same applies to ski movies. For those sweeping landscapes, for example, one of our main references was The Hateful Eight because they used anamorphic lenses, which was similar to what we had. It was also filmed in Telluride, Colorado, so we took note of what they did. We decided we wanted to find some clouds and a blizzard, because that helped create some of the sounds we really liked. To create that blue look that’s really prominent in the piece we decided to shoot in the twilight. For the most part, you start with something in mind and then project over time takes a life of its own—and it’s fun to pay homage. We wanted it to feel like a Western, versus a ski movie scene that looks like a Western. Vila argues: are action sports athletes that different from bull riders and the cowboy lifestyle? Vila Screengrab. Given your background, do you relish in these opportunities to do something completely new? CV: I guess you’re always looking to do something out of the norm. When you get a call to do a ski movie segment in Crested Butte, it’s hard to come up with something that is out of the norm. That creative is pretty typical, so I always try to make my work as unique as possible. When it comes to the opportunity to create a director’s cut, do you see it as a chance to push yourself more? CV: It’s simply that the director’s cut was my initial vision. Todd Jones is so awesome with this because he wants me to work this way. He lets me shoot for what I’d want the piece to look like, and then I shoot footage that will be useful for the ski film. I think it's the best way to do it because the ski film and my filmmaking are two totally different things. But it’s easy to satisfy both, and I love seeing how the ski film segment is put together for the film too. 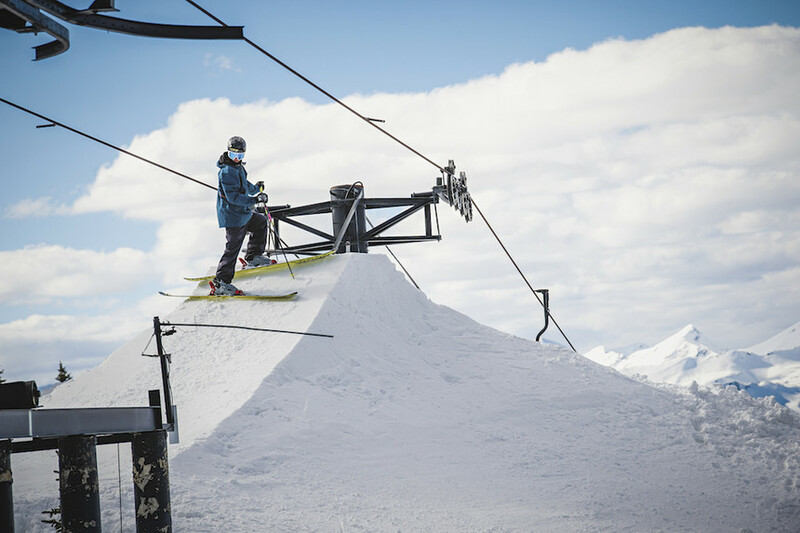 It’s just a different audience, which means they need more of a classic ski part that requires more energy. Especially considering that this was in the middle of the movie, you need to respect that the movie’s creative has already begun. You can’t try to make it too much of your own. Instead of trying to satisfy both, I give them the footage and they can do whatever they want for the ski movie. Then they give me my footage after and I get to do whatever I want for my director's cut. It’s a great way to collaborate. Is it a challenge creatively to shoot with those two needs in mind? CV: Sort of. It’s always good to build walls around your ideas whether it’s commercial, documentary, or ski film projects. You’re always going to have limitations. Obviously, with a documentary you’re limited to the story—you can’t make up characters. Something like this where my creative boards were simply that we had to shoot this ski mountain, well, that’s very vague. So, there’s a lot of responsibility to come up with something good. But at the same time, there’s a lot of freedom for creative control. Unless you’re writing fiction you’re always dealing with constraints and I think it's a fun part of it. Sometimes you hate the creative at first and after spending a long time with it, you start to find out that it could be awesome. It’s all part of the process. What was most memorable about shooting in Crested Butte? CV: Flying in a helicopter is always cool, but from the filmmaking side of me, it was shooting those big sweeping landscapes. It was really fun because genre construction was the most important part of creating the look. Everyone wants to see heli footage, but we wanted to be on the ground with a tripod. Why? That’s how the genre looks and what makes you feel isolated, and that’s why they do that. Hollywood has the potential to shoot in a helicopter, but if you want to feel like you’re in the mountains and see that expansive landscape you have to see it from eye level to create that emotion.